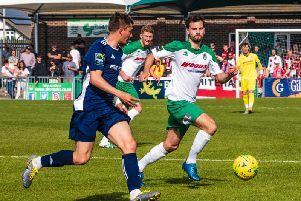 For the second week in row Haywards Heath Town and Ashford United met and once again it was all level after 90 minutes. Heath made the trip to Ashford Utd in their first ever outing in the Buildbase FA Trophy, having hosted Ashford in the league the previous Saturday the two side knew it would be a tough match ahead. Ashford have a lovely stadium and the travelling few were warmly greeted and looked after by the club officials. The match itself saw the hosts start fast as once again Heath seemed to take time to adjust, in the first minute Ashford struck the post and this warning sign was not heeded as the hosts dominated the opening 20 minutes through good play and Heath's poor passing. Heath did see a good effort from Karly Akehurst well saved in the eighth minute as Callum Saunders sent in a free kick which found Melford Simpson, he put the ball into Karly and his turn and shot needed a fine save. It was the hosts dominating possession and it was no surprise that they opened the scoring on 15 minutes but disappointing that Josh Wisson found himself in space from a corner and made no mistake with a free header. Heath really should have pulled a goal back straight away as a flowing move on the right worked its wy left to Max Miller and with time and space put the ball the wrong side of the post. Ashford again upped their game and saw two efforts go high and wide of the target, the scoreline was doubled on 21 minutes when good work down the Ashford right following a quick free kick caught Heath sleeping and Ollie Rowe headed in without a challenge. It looked as if Heath were going to be for a long afternoon but they were once again going to show the resilience and fighting spirit they have in many games this season. Melford Simpson saw a back post header go wide before another header that the keeper Sam Mott fumbled but as Callum Saunders stabbed the ball home the referee blew up for a foul on the keeper. Heath's pressure did pay off as they found a way back into the game on 33 minutes through Kane Louis as he was cool and composed in the box and made no mistake slotting the ball in from the six yard box. There were no further chance before the break as the the sides went in to no doubt very similar team talks. If Heath were told to keep the game tight that went out of the window with Ashford regaining the lead with just 4 minutes played of the second half, it was yet again poor making as Sam Corne got in on the act of heading in unchallenged. With 63 minutes played the hosts once again put Heath on the back foot as a sweeping move saw the ball get to Sam Corne and his angled effort squeezed under Josh Heyburn in the Heath goal. Melford Simpson went close to leveling the game back up but his lobbed effort just cleared the bar. Heath introduced Kieran Rowe and his energy started to cause Ashford problems, with 75 minutes played some great footwork saw him create some space and effort low down to the keepers right needed a full stretch save. Just a minute later it was all square and heading for a replay as a Heath freekick went straight down the middle that Callum Saunders took under control before slotting into the bottom corner. With time running out both Ibrahim Fofane and Patrick Akwasi replaced Max Miller and Sean Roddy and it was Ibrahim who went closest to giving Heath the win but his great effort from 18 yards was brilliantly tipped over with just 4 minutes remaining. A blocked effort from Karly Akehurst and an effort in Injury time from Ashford that cleared the bar were the last chances as the match finished all level and goes to a replay on Tuesday night at Hanbury. Afterwards Assistant Manager Roy Staughton said "Today we once again showed how resistant and determined we are, to keep getting back into the match shows great character but we need to also tighten up as we gave away too many easy goals today"